OpenWorm aims to build the first comprehensive computational model of the Caenorhabditis elegans (often called C. elegans, even if this term is a species abbreviation), a free-living, transparent nematode (roundworm), about 1 mm in length, that lives in temperate soil environments. With only a thousand cells, it solves basic problems such as feeding, mate-finding and predator avoidance. Research into the molecular and developmental biology of C. elegans was begun in 1974 by Nobel prize laureate Sydney Brenner and it has since been used extensively as a model organism for development biology. Sydney Brenner founded the Molecular Sciences Institute in Berkeley, California. 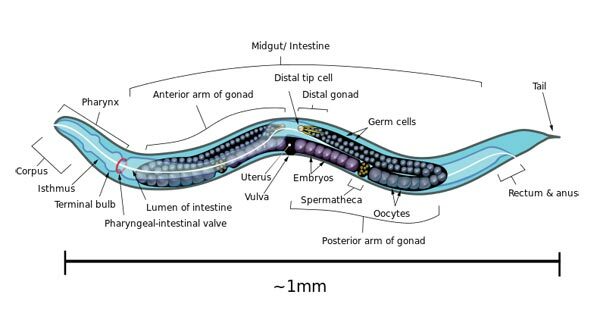 The basic anatomy of C. elegans includes a mouth, pharynx, intestine, gonad, and collagenous cuticle. C. elegans has two sexes: hermaphrodites and males (0.05%). C. elegans is one of the simplest organisms with a nervous system. In the hermaphrodite, this comprises 302 neurons whose pattern of connectivity (connectome) has been completely mapped and shown to be a small-world network. C. elegans was also the first multicellular organism to have its genome completely sequenced. The genome consists of six chromosomes (named I, II, III, IV, V and X) and a mitochondrial genome. The sequence was first published in 1998 with regular updates, because DNA sequencing is not an error-free process. The latest version released in the WormBase () is WS238. WormBase is an international consortium of biologists and computer scientists dedicated to providing the research community with accurate, current, accessible information concerning the genetics, genomics and biology of C. elegans and related nematodes. Founded in 2000, the WormBase Consortium is led by Paul Sternberg of CalTech, Paul Kersey of the EBI, Matt Berriman of the Wellcome Trust Sanger Institute, Lincoln Stein of the Ontario Institute for Cancer Research, and John Spieth of the Washington University Genome Sequencing Center. Richard Durbin served as a principal investigator until 2010. Despite being extremely well studied in biology, the C. elegans still eludes a deep, principled understanding of its biology. The OpenWorm project uses a bottom-up approach, aimed at observing the worm behaviour emerge from a simulation of data derived from scientific experiments carried out over the past decade. To do so, the data available in the scientific community is incorporated into OpenWorm software models. An open-source simulation platform called Geppetto is used by the OpenWorm Project to run these different models together. An OpenWorm Browser enables ready access to a cell-by-cell 3D representation of the nematode C. elegans in a WebGL enabled browser. The 3d browser was created with the help of the Google Labs Body Browser team. The browser has also been ported to an iOS app to support the project. All the code produced in the OpenWorm project is Open Source and available on GitHub. The OpenWorm project is realized by a highly motivated group of individuals who believe in Open Science. The OpenWorm website includes a Blog, a Wiki, a FAQ and Donate page, lists about milestones, projects, events, publications, getting started and getting involved resources and more.